Whisk eggs, salt, and pepper together very well. Pour eggs into hot skillet. Quickly jiggle skillet while cooking. Using a spatula, pull eggs away from side of pan to allow uncooked eggs to set. Sprinkle fine herbs over eggs. 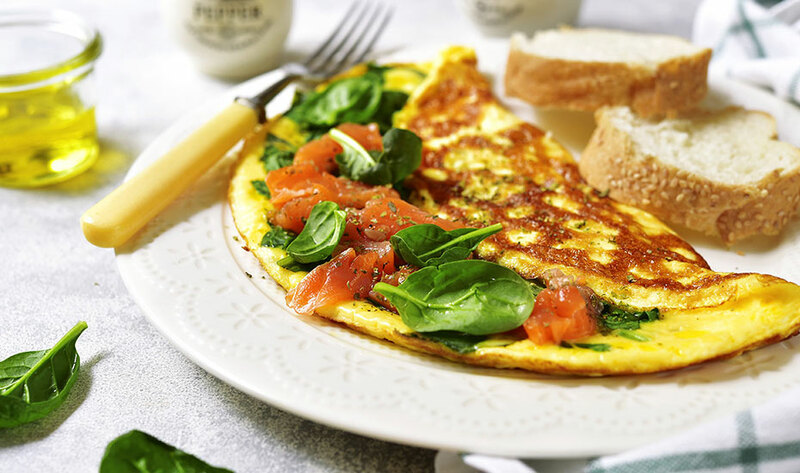 Run a rubber spatula along the sides of omelet to loosen eggs from skillet. Slide spatula under left side of eggs. Fold 1/34 of omelet into the center. Lightly press down on folded omelet to seal. Lifting the pan to the plate, place spatula under right side of omelet. Lift and slide remaining unfolded part of omelet onto the plate. Using the edge of the pan, flip folded eggs over. You should have a three-fold omelet with the flap on the bottom.